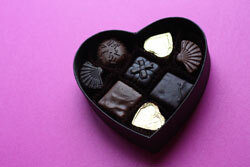 Getting chocolate from a sweetheart could benefit your romance and your heart. A new study suggests that dark chocolate can help prevent heart problems. At an estimated annual cost of $42 a person, dark chocolate could reduce fatal and nonfatal cardiovascular events. Previous research suggested that chocolate can lower blood pressure and cholesterol levels but every study has been short-term in scope. To estimate the long-term effects of chocolate consumption, researchers analyzed data from the Australian Diabetes Obesity and Lifestyles study which included 2,013. Using statistical models and risk-prediction algorithms, researchers estimated how daily consumption of dark chocolate would affect patients with metabolic syndrome over 10 years. Under the best case scenario, daily consumption could prevent 70 nonfatal and 15 fatal cardiovascular incidents for every 10,000 people. If patients were only 80% compliant, those numbers dipped to 55 and 10 respectively. Even with these lower numbers, researchers concluded that eating dark chocolate is a cost-effective preventive measure. But milk-chocolate lovers be weary: these cardiovascular benefits are only apparent in chocolate containing 60-70% coco or enriched with polyphenols. The coco bean is rich in polyphenols and flavonoids with antihypertensive properties and positive metabolic effects. Flavonoids have also been shown to slow cognitive decline in older adults and prevent stroke. Zomer E, Own A, Magliano D, et al. The effectiveness and cost effectiveness of dark chocolate consumption as prevention therapy in people at high risk of cardiovascular disease: best case scenario analysis using a Markov model. British Medical Journal 2012; 344:e3657.